Book Condition: A copy that has been read, but remains in excellent condition. Pages are intact and are not marred by notes or highlighting, but may contain a neat previous owner name. The spine remains undamaged. At ThriftBooks, our motto is: Read More, Spend Less. As identity theft and corporate data vulnerability continue to escalate, corporations must protect both the valuable consumer data they collect and their own intangible assets. Both Congress and the states have passed laws to improve practices, but the rate of data loss persists unabated and companies remain slow to invest in information security. Engaged in a bottom-up investigation, Harboring Data reveals the emergent nature of data leakage and vulnerability, as well as some of the areas where our current regulatory frameworks fall short. With insights from leading academics, information security professionals, and other area experts, this original work explores the business, legal, and social dynamics behind corporate information leakage and data breaches. The authors reveal common mistakes companies make, which breaches go unreported despite notification statutes, and surprising weaknesses in the federal laws that regulate financial data privacy, children's data collection, and health data privacy. 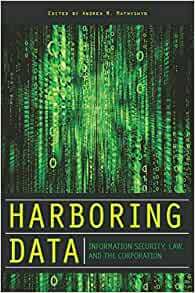 This forward-looking book will be vital to meeting the increasing information security concerns that new data-intensive business models will have. Andrea M. Matwyshyn is an Assistant Professor of Legal Studies and Business Ethics at The Wharton School at the University of Pennsylvania. Her research and consulting focus on U.S. and international issues of information policy, corporate best practices, data privacy, and technology regulation. Start reading Harboring Data on your Kindle in under a minute.